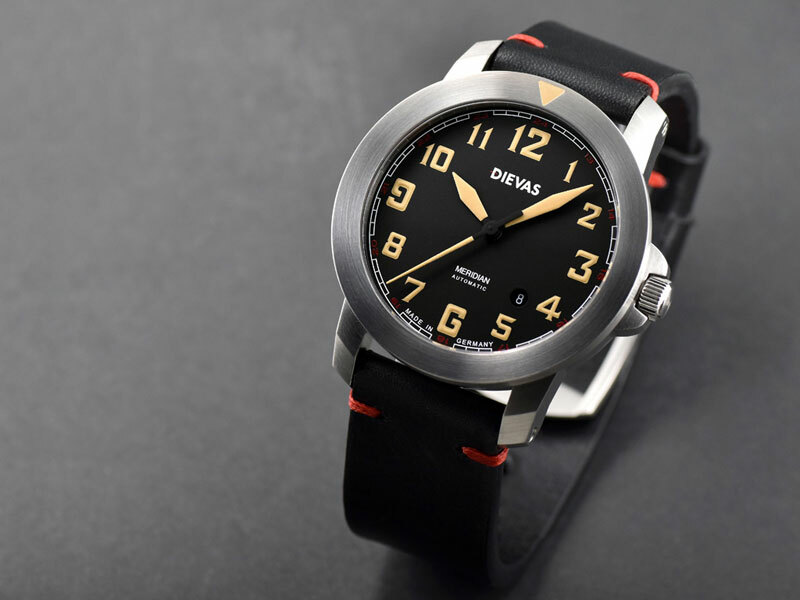 Measuring 44mm and 11m thick, the Dievas MERIDIAN is a watch of peerless proportions. A large watch dial ensures easy time reading at a glance whilst the slender height still add a desirable heftiness for a superb feel and fit. The case itself is an original Dievas design with every part designed and drawn up from scratch. 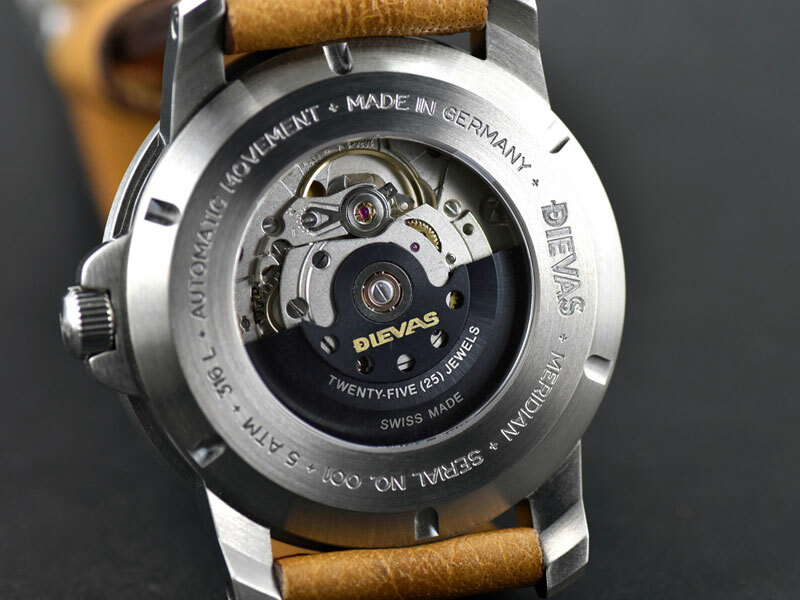 Machined from German steel on the latest multi axis CNC machine, like all Dievas timepieces, each milled piece is further hand finished by our watchmakers. The latter is where Dievas win over our critics; through accomplished high quality old-fashion watch making experience and an immaculate eye for details, our hand finished watch case radiates a glimmer of luster and sheen superior to any other. The bi-directional bezel allows quick timing of short durations. Scratch proof and unblemished Swiss sapphire crystal seals the top half of the watch. The heart of the MERIDIAN is the Swiss Made ETA 2824-2 modified by Dievas Uhren Technik, each movement is regulated to the utmost accuracy before leaving the watchmakers bench. A Black Plasma treated rotor is seen through the display sapphire crystal back. 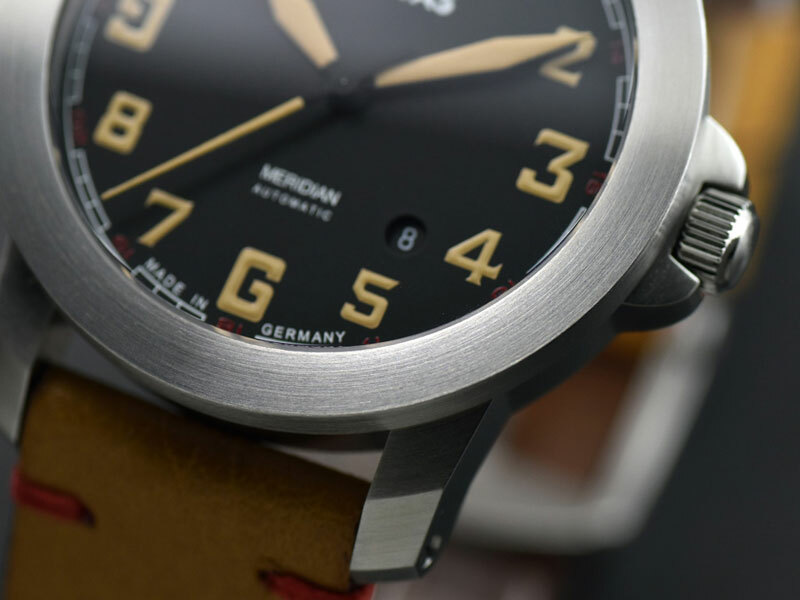 The MERIDIAN's dial mimics WWII fighter planes clocks coupled with Dievas' signature pilot watch hands. Printed with the latest technology, the watch dial is flawless even under magnification. All the numerals are applied with 3-dimensional radium looking SuperLuminova that glows brightly in the dark. 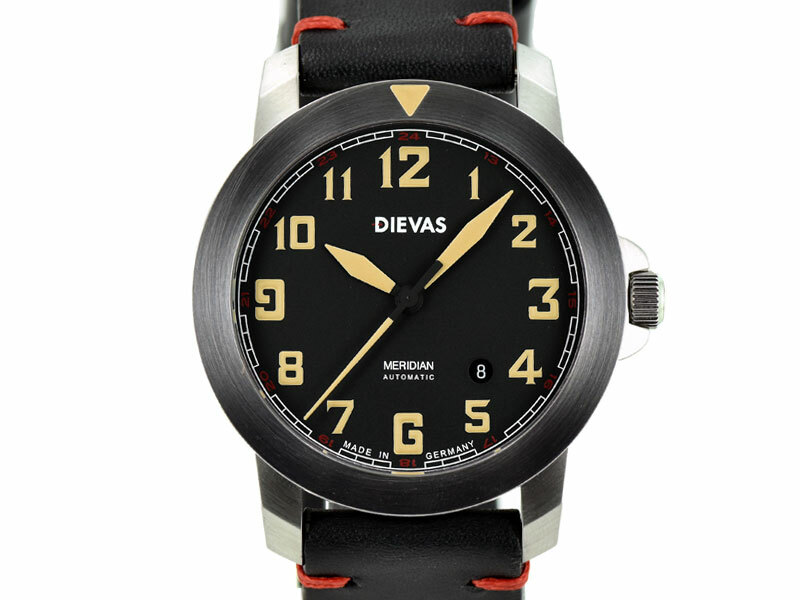 Adding to the handmade theme of the Dievas Meridian is the artisan leather strap. Every strap is handmade in-house with Italian sourced calf leather, supple and heavenly comfortable. Due to the handmade nature, each strap is unique and individually numbered in accordance to the watch's serial number. 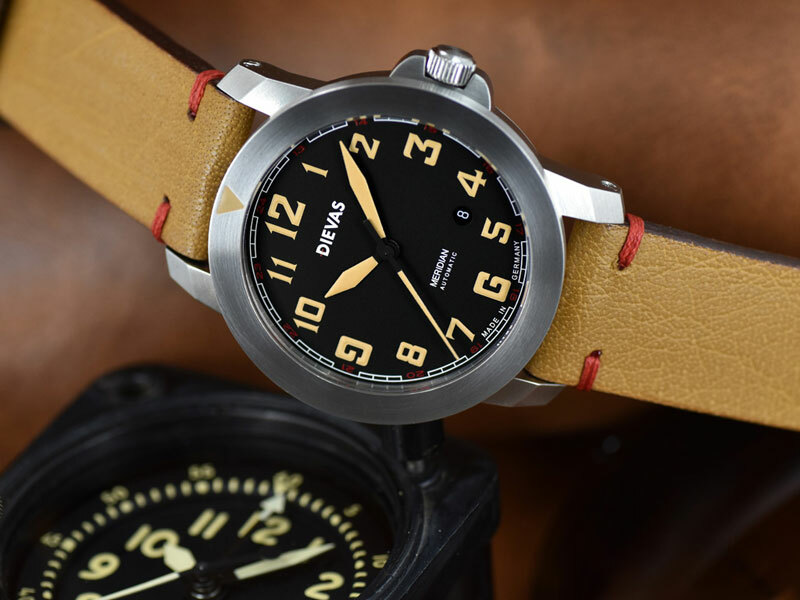 The German made Dievas MERIDIAN is a pilot watch made from the best materials and skill. A simple watch, that upon further inspection reveals a culmination of vintage watch design with complex modern and advance German watch making technology. A watch that does the job better than others above or under the radar. Case BackDievas signed. Circular satin brushed. Sapphire display back. BezelBi-directional. Circular satin brushed. Old Radium SuperLuminova. StrapBlack or Vintage Tan handmade calf leather strap with red ends stitching. Individually numbered. Additional NATO Strap.